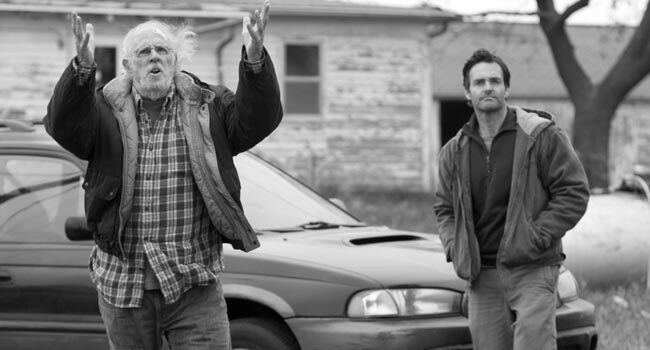 The strength of Alexander Payne’s Nebraska is its astonishing insight into the unassuming dignity of the elderly. Having not aged beyond the meagre year of 26, I cannot speak with much authority as to the concerns of people in their final years, but they are without doubt a distressingly overlooked branch of our society. Nebraska reminds us that our elders were as invigorated with youth once as we, and they’ve a whole life to show for it. Woody (Bruce Dern) is found by police trying to hike from Billings, Montana to Lincoln, Nebraska to claim the million dollars he has been awarded as prize money by a magazine. It’s a scam, as his two sons David (Will Forte) and Ross (Bob Odenkirk) try to explain, but Woody, his mental health slowly deteriorating, shows such a single-minded determination to retrieve the money that eventually David relents and agrees to drive him to his destination. Much of the film takes place in the small town of Hawthorne, Nebraska, where Woody and his wife Kate (June Squibb) grew up and where David and Woody are forced to stop after Woody injures himself. Despite David’s protestations, Woody lets slip about the money and he becomes an instant celebrity in the small town. Old friends and family become reacquainted with Woody, many of whom have certain ideas as to how Woody should use his newfound wealth. Nebraska is powerful in the most understated of ways. The story surrounding Woody’s bogus winnings and the Hawthorne townsfolk’s interest in his finance seems secondary in relation to the strong existential impression the film makes. Woody did not have an astonishing life; rather Nebraska suggests that all lives are astounding by the fact that even at their most simple they are always full of experience. Woody is reticent at the best of times, something he seemingly inherited from his family, with little ambition, but this is never seen as a fault. A lesser film might have exaggerated his character quirks. Nebraska portrays Woody as a man who is the sum of his life. Dern is remarkably natural as Woody, and manages to bring immense depth to a role full of eccentricities. Also important is June Squibb as Kate, who fills both the audience and David in on the parts of Woody’s life that he would never comment on, which is most of it. There’s a real sense that only Kate could be married to Woody and vice versa, which may be overly sentimental, but is something that often become true after a lifetime of marriage. Will Forte, best known for his comedic work, underplays David well and conveys that inescapable interest a son will always have in the mystery of their own father perfectly. Nebraska flags during its final half hour, during which Payne feels the need to wrap up the plot concerning the million dollars. It’s unnecessary and cheapens the time Woody and his family spent in Hawthorne. But for the most part, Nebraska is extraordinary in its ability to find affirmation amongst the gloomy. Woody is in the tail end of his life and his mind is fading, but Nebraska never separates the man he’s become from the man he was most of his life.